I have an admission to make. Ever since the atrocities of Gaza, I have not been able to blog about Hijabi Life (food, faith, parenting and fashion). Why is that? It seems frivolous. Children are suffering all over the world and I am writing about the best eyeliner or hijabi fashion trend? How out of touch does that make me sound as a Muslim American who is privileged enough to live in peace and prosperity? Let’s take a lesson from Marie Antoinette and not be complacent with our comforts. However, the news has taken to breaking my heart and I can’t stay silent any more. With attacks like the Sydney Siege and Peshawar, it seems like the Muslim narrative is being written by a few extremists and I refuse to let them speak for me. It is my responsibility to use my privileged position to not only speak out against these sick individuals, but try to help make the world a better place with my own actions. Muslims need to get out of the reactionary mindset and start doing things. Far too often we see Muslims reacting to what extremists do. How about if Muslims band together and actually do something versus reacting? Instead of criticizing those who are doing something, get out and do something good. Instead of the typical knee jerk reaction to the news, I ask you all for a favor. Let’s do something to make the world a better place. Let’s volunteer in our communities. Let’s take a moment out of the bubble of our own lives to empathize with those who are less fortunate. It can be as simple as donating to your local food bank or reading to kids in the library. When we look at the Sunnah of the Prophet (saws), we will see he was never ever harsh. Why is it that we are so harsh and hard hearted? Extremists are the polar opposite of the teachings of Muhammed (saws) and actually reflect the way people were in the time of Jahiliyya (time before Islam). Let’s pray to God that we are not like them. I am grateful for my family, health and other blessings, but it is time to start giving back. What will you do to give back for your own blessings? Spring is almost here which means hijabis are starting to tuck away their knee high boots and thinking about long, floaty, maxi skirts in colorful pastels. 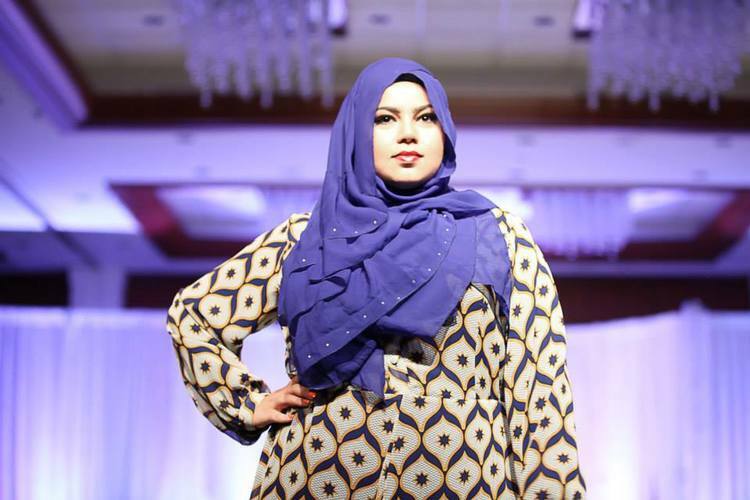 One of the things that is challenging for curvy hijabis is how to wear a pleated maxi skirt without adding extra bulk. One way that curvy hijabis can sport the pleated maxi skirt is to wear a high waisted pleated skirt versus one that is pleated down to the hem. This way, you get graceful drapes below with pleats that define your hourglass shape. 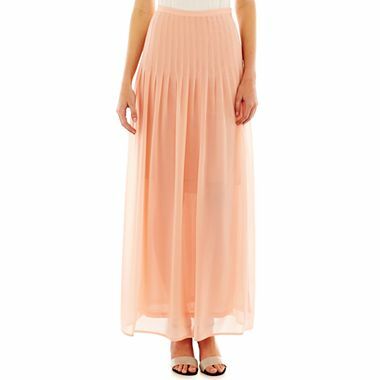 I found the perfect pleated maxi skirt at JCPenney from the Buffalo Jeans collection. Another bonus is that it is fully lined versus other maxi skirts that only have a mid length lining (I always find this to be super annoying). One thing to note is that this skirt still needs a slip because the lining is too sheer for hijabis. For $35, I think this skirt is not just cute, but it’s a steal!